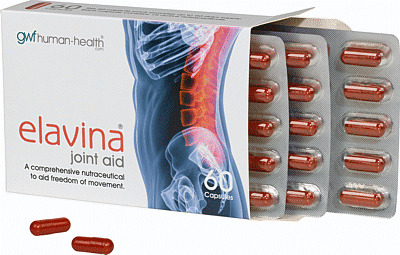 Elavina is a very high specification encapsulated nutraceutical designed to help maintain freedom of movement, aid supple joints and support the natural anti-inflammatory actions of the human metabolism. The term 'Nutraceutical' is a portmanteau of the words 'nutrition' and 'pharmaceutical'. They are products derived from food sources that provide extra health benefits in addition to the basic nutritional values found in the food itself. Oat oil contains galactolipid emulsifiers that create a very fine emulsion during digestion that aids the passage of nutraceuticals across the gut-wall. This natural delivery system is very important and is called passive transfer. Oat Beta-Glucans have an EU approval for their role of reducing cholesterol levels however they also support the immune system and healing processes. Natural Vitamin E is very supportive in preventing tissue damage caused by free radicals. This helps to maintain all connective structures in the body. Glucosamine gives cartilage its structure and shock absorbing qualities. It is an essential building block for the production of glycoaminolglycans that are used to regenerate proteoglycans in cartilage. These proteoglycans absorb water within the cartilage and give it the vital cushioning, fluidity and spacing properties between the bones for healthy joints. The demand for glutamine is increased during stress associated with exercise, illness or trauma. It encourages protein synthesis and helps with muscle growth and recuperation following workouts. Glutamine provides a fuel source for intestinal mucosal cells and necleotide production by lymphocytes cells in the immune system. Chondroitin is a source of actual glycoaminoglycans essential for the resilience and natural regeneration of cartilage between the bones of the joints. It helps maintain normal enzymatic activity and water holding capacity within the cartilage to provide resistance to compression and to prevent bone on bone contact. MSM is a source of sulphur that supplies one of the most prominent and important compounds in the body. Sulphur helps to form cross links with other molecules that maintain the strength and integrity of connective tissues. It is also essential for the manufacture of collagen which forms the framework and structure of all tendons, ligaments and cartilage. Curcumin is the active ingredient of the spice, turmeric. It is a natural and powerful antioxidant and supports the normal anti-inflammatory action of the body. Beta Glucans, from yeast cell walls, are special carbohydrates that attach to surface receptor sites on human immune cells called macrophages. Research studies over 40 years have demonstrated that when these sugars are present at those receptor sites, macrophages become more active in proliferating and releasing an immune response to alien substances found in food and the environment. Lycopene is a pigment that gives vegetables and fruit their red colour, e.g. tomatoes. It is also a very powerful natural antioxidant and supports tissue cells resistance to damage caused by the production of free radicals created during the burning of oxygen for energy. The inclusion of lots of red fruit and vegetables in the diet has been associated with maintaining good health. Glycine / Proline and Hydroxyproline (derived from proline) are the main amino acids that make up and stabilize the constitution of collagen. The other amino acid, hydroxylysine, is derived from lysine, which is supplied in large quantities in normal foodstuffs. The production of collagen in the body involves vitamin C, glycine, proline, hydroxyproline and lysine. Collagen acts as the body's glue (e.g. it sticks teeth to gums) and forms the framework that allows tissues to grow and wounds to heal. Genetic defects in collagen manufactured in the body can cause problems, such as loose joints. Vitamin C is involved in the natural healing process, the formation of collagen and is important to the immune system. Whenever tissue must grow, develop or repair itself after injury, collagen is needed to hold everything together. The ability of the human body to store vitamin C is very limited so regular intake is very important. Trimethylglycine functions very closely with other vitamins, amino acids and trace elements to form 'methyl donors' that donate methyl molecules to facilitate necessary chemical processes in the body. This is very important for proper liver functioning, cellular replication and detoxification reactions. The natural repair and regeneration of tissues by the body involves cellular replication. Manganese is thought to be a crucial component in the rebuilding of cartilage. Manganese supports many enzyme controlled reactions and plays an important role in the production of glycosaminoglycans from glucosamine building blocks. Probiotic cultures are strains of beneficial bacteria, normally found in the human alimentary canal, which help maintain a healthy digestive system. Swallow one to a maximum of two capsules per day after food. Do not chew. A cold drink taken just before / during swallowing will aid the passage of the capsule. Q. I am currently on prescription medication from my Doctor. Am I able to take Elavina? A. Elavina Joint Aid is a non-steroidal product made using very high quality ingredients and there should be no adverse reaction when using it in addition to your prescription medicine. However, in all cases where medication is being used, we advise that advice is sought from either your prescribing Doctor or pharmacist as a matter of course. Q. Your pack says take 1 to a maxiumum of 2 capsules per day. How many should I take? A. If you are experiencing restricted movement and/or physical effects caused by injury or strain, we recommend taking 2 capsules per day. If you simply wish to maintain current good physical condition and freedom of movement, we recommend taking 1 capsule per day. Q. I've just started taking Elavina, how quickly will I see a result? A. In our experience, the speed at which people respond to taking Elavina Joint Aid usually falls somewhere between day 3 and week 3. Age, weight, current health, diet and the physical status are just some of the factors that can impact the time taken for the benefits to show. Q. At what age can you start taking Elavia? A. Elavina Joint Aid is not suitable for children under the age of 16 years. It is recommended for anyone over this age, regardless of weight and level of exercise. Q. Is Elavina suitable for vegetarians and/or vegans? A. Elavina Joint Aid contains ingredients that are from marine souces so are not suitable for vegetarians or vegans. Q. Is Elavina gluten free? A. Oats contain a protein called Avenin – this is similar in structure to gluten. All oats will also contain traces of wheat, rye and barley, and should not be regarded as gluten free. Elavina contains oat bran which comes from dehulled oats. This reduces the likelihood of contamination by other cereals, however it does contain approximately 13% protein, some of which will be avenin. There are currently no questions for Elavina Joint Aid For Humans - be the first to ask one!